More American black metal. The inadequately-named False were signed to Gilead apparently after worshipful recommendation by Louisiana sludge monarchs Thou. They thus became label-mates with some of the most interesting USBM acts on the scene today; Fell Voices, Ash Borer, and so forth- bands whose virtues I have discussed at great length in countless previous reviews. This two-song EP, though, contains things that you simply won’t find with those acts. Synth strings, for one thing, and a big, roaring sound that seems a world away from the determinedly low-fi approach of the abovementioned. This is black metal that could easily ignite the interest of devotees of the more elaborate end of the 90s wave (e.g. Anthems to the Welkin at Dusk), bearing some subtly-executed symphonic hallmarks alongside some properly swinging death metal-influenced riffing. Indeed, first track the Key of Past Suffering reminds me of Opeth as much as anything else. Normally I’d use that comparison to perfunctorily suggest alternation between loud and soft sections, but here I mean to invoke the powerful stride of the likes of The Leper Affinity’s opening riff. For those are the first impressions here, albeit given a strong blackened tint by the rasping vocals. As the song progresses throughout its thirteen-minute running time, these thin, wavering synth strings start lurking in the background. In contrast to the ballsiness of the guitars, the synths don’t have the extravagance of many “symphonic” bands, focusing more on haunting the sound rather than giving it pomp. It’s not until about six minutes in that they start to float to the fore. When they do, the tone of the track changes into a winding blast very much akin to Anthems…-era Emperor. It’s an impressive barrage which all comes together into a blood-pumping melodic black metal climax after ten minutes. Second track Sleepmaker feels a bit more ambitious and unorthodox. Its first section plunges immediately into a rumbling blackened pelt, but one in which the time feel shifts enigmatically, with tonality somewhat more abstract than before. Then it segues into a woozy quiet section, which is reminiscent of weirdo Germans Klabautamann. In this drawn-out, shifting approach, there is more in common with other US acts like, obviously, Weakling- in fact the band names seem to echo each other. This is a really intriguing EP, which demands further investigation from even casual black metal listeners. 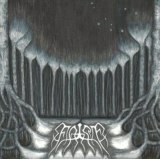 In fact, the progressive and death metal elements of False’s sound mean that perhaps it is best suited to casual black metal listeners- it does, in many ways, feel accessible and fresh. The band is compositionally ambitious, but balances this with a powerful sound and a keen ear for melody. Well-worth seeking out.